This is it. 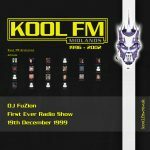 My first radio show on Kool FM. Man I was nervous. Did I know how to talk on the mike? No. Was I fully proficient in the arts of mixing & beat matching? Questionable. Did I have the potential to grasp these skills? The Kool FM management seemed to think so, now let the listeners be the judge. My first show was on the graveyard shift, from 1am to 3am, but with friends & family listening as well as ravers who had my back, it was time for DJ FuZion to step up to the plate. … Me? A DJ on Kool FM? Take that non-believers!